"Close" button on Window Picker Applet should be at left side, but now it is at right. @Kamus: Could you possibly motivate why this bug should be low? And also, since you defined the importance could you possibly confirm this bug? BTW, Close Button, in a window, is the most used button. A normal user use it hundreds times a day. Why a so dramatic inconsistence like this (the button is in the opposite position if window is maximixed or de-maximized) is Low importance? Paolo Sammicheli , I'm not sure why Kamus has set it to Low , This bug is actually a wishlist . Pls see , Bug #532633 , which is the main cause of this inconsistency. @Vish: I'm perfectly aware about Bug #532633 , but there they are discussing if left is better than right for default theme, an Mark already stated the final decision. Here we're talking about UNE partially apply the changes about button placement and partially not, having an inconsistence in user interface. Hi Rick, sorry for bother you. 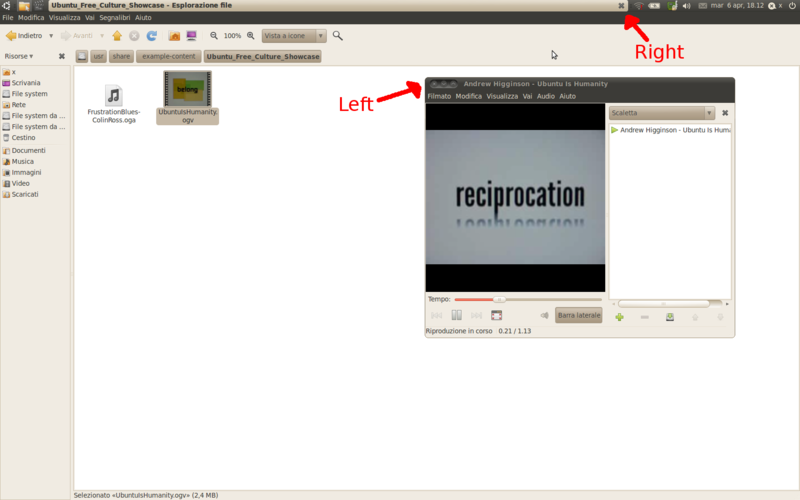 Are you aware about this problem in Ubuntu Netbook Edition? @Paolo Sammicheli , I agree with the inconsistency , hence this needs to be fixed in maximus. There are nearly 700 odd comments and afaik , this difference was mentioned too and still the decision was taken. Since the light theme is the same package used for both UNE and Desktop , unfortunately changing it for UNE is not possible without affecting the Desktop. @Vish: I agree perfectly with you. What I don't understand is the "Low" priority. This should be fixed before the release IMHO. From the user experience prospective this is a big issue. This would be a change in the window-picker-applet. Maximus or light-themes have nothing to do with this behavior. @Vish and @Paolo, you are right was a mistake for my part, all apologies for that. I'm not English native speaker, so forgive me if I'm misunderstanding that wiki page. IMHO, while Low's example could be cosmetic/usability issue, the main definition of Low is also "Bugs which affect functionality, but to a lesser extent than most bugs". In this case I suppose we've not a "lesser extent" because it affect every user on every window. Let's see what Rick or somebody else in Desktop Team decide about this bug, my only concern about priority is if this issue isn't valuated in time for fixing it before release. I have no reason to second guess Didier's judgement on this. Since Mark Shuttleworth decided to move buttons to the left finally (see https://launchpad.net/ubuntu/+bug/532633/comments/564), so please can you fix this bug before 10.04.1 release (July 29th)? The decision has already been taken and I'll be fixed in maverick, not changing UI for lucid, especially after release. See above comments. If you plan for Maverick to put to the left the close button of maximus, it will be great ! All the icons of opened applications and the close button wil be in a near area, this will be more confortable instead of going on each side of the screen all the time. Yes. Ubuntu Netbook 10.10 will have Unity interface by default (https://launchpad.net/unity), so window controls will be on left, and list of opened applications will be in a dock on the left side of the screen. Since it's not a bug in light-themes (ubuntu), it should be marked as invalid. It's just a discussion about placing buttons to left/right in Metacity title, and final decision was to place them to LEFT. Also, I think it won't be fixed in Window-Picker-Applet because Ubuntu-Netbook 10.10 will come without it (ubuntu-netbook-unity-default-settings does not depend on it). It is fix-released in unity only. The inconsistency of having buttons at the right is still present in window-picker-applet (and note that bug title says 10.04 not 10.10). window-picker-applet is the default in 10.04. Also, it is still useful to many netbook users whose hardware does not meet the requirements of unity.